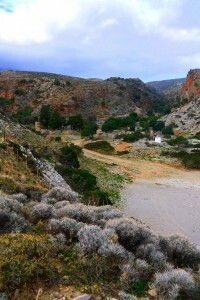 Home/Day Trips, Days to Remember/What about going Safari in West Crete? Visit Menies beach! A visit to the beach of Menies is not only about going to another great beach to swim. 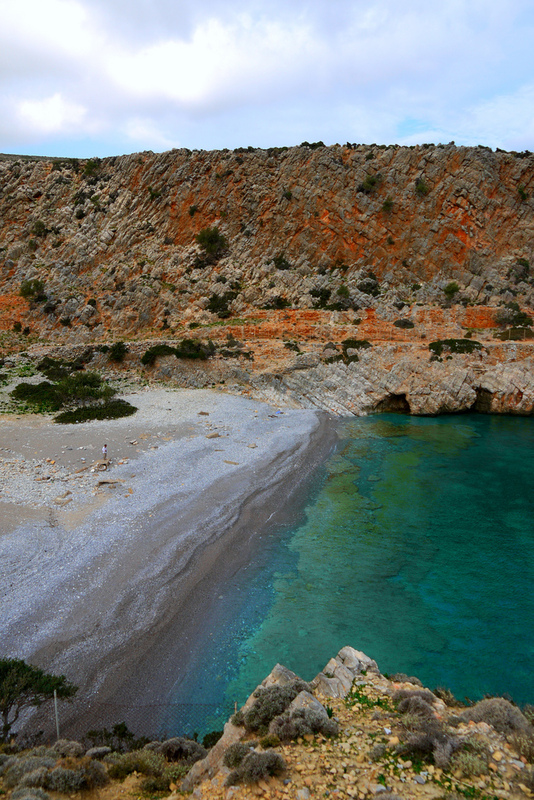 It combines history (from 530 BC to 9th century AC and 1940s), wild Cretan nature and a beautiful and quiet beach. The total distance that you have to cover to get to the edge of the Cape Spatha is about 35 to 40 km or about 1,5 hrs. We call it safari as the track is dirt for the majority of the time and having a 4×4 will help you enjoy the trip much more! However, conventional cars can complete the route but you have to be careful. 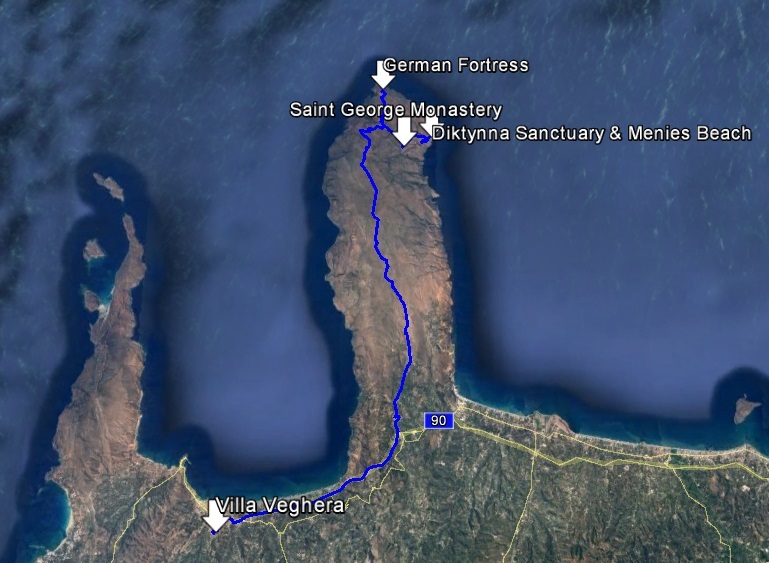 The best route to follow is to go first to the Monastery of Saint George and then to the beach to swim and explore the ruins of Diktynna Sanctuary around there. Just before the sunset it worth visiting the German Fortress and then head back before the sun goes down and there is no light at all. To reach the fortress from the beach it takes about 15-20 minutes and the way back about 1,5 hrs. Click to the map on the left and check the route. 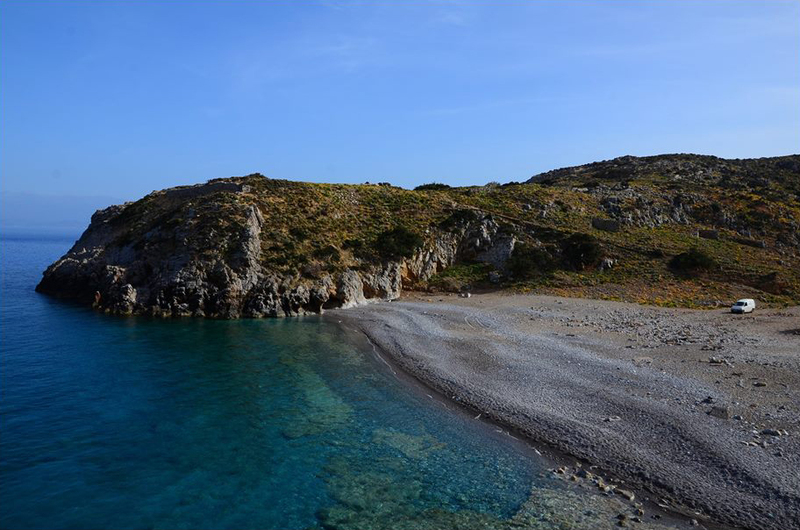 The main reason to start this journey to Spatha Cape is to go to Menies Beach! The whole route is full of sightseeing but the highlight is the amazing beach of Menies. This amazing small bay located in the north-east side of the cape is a must visit as you will see a pure beach with no signs of modern civilization. 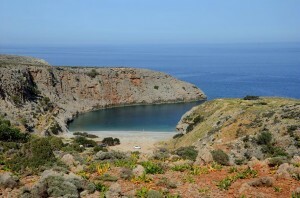 The place is ideal for diving and spare-fishing, as well as, just to relax in a distant beach. This place does not get crowded so it is ideal in case you want to avoid busy beaches on high season days. What you have to be careful about is the lack of nearby facilities. Prepare your supplies and get whatever required from Kissamos as the closest village from Menies is 20 km away (Rodopou Village). Nearby Facilities: No facilities nearby. Closest village is Rodopou, 20km away. – Take an umbrella with you to have the ability to stay longer at the small island that is not organised. – Take water, food and other supplies from Kissamos as there are no facilities nearby. – Diving mask/goggles would add a lot of fun! – For the explorers we suggest you have a pair of snickers as well in order to be able to walk around. The cape is protected from the Natura 2000 as it is rich of Cretan flora and full of views of wild and untouched Cretan landscape. On your way there be cautious and look around for rare species of flowers, herbs and trees. Diktyna is the ancient goddess of hunting, wild nature and mountains. It is said that this was the most important temple of the goddess, who is believed to be Artemis, the goddess of Hunting in ancient Greece. The name Diktyna comes either from the fishermen net (Dikty) or from the mountain Dikty. The worship of goddess Diktyna spread to Athens, Sparta and even to Marseilles. However, in west Crete it was very popular as temples of her were located in ancient towns such as Lissos, Polyrinia and Falasarna. Apart from the temples goddess Diktyna is also met in coins of these towns. As per Herodotus the temple was built by Samius from Kydonia around 530 BC and flourished during Hellenistic and Roman times. 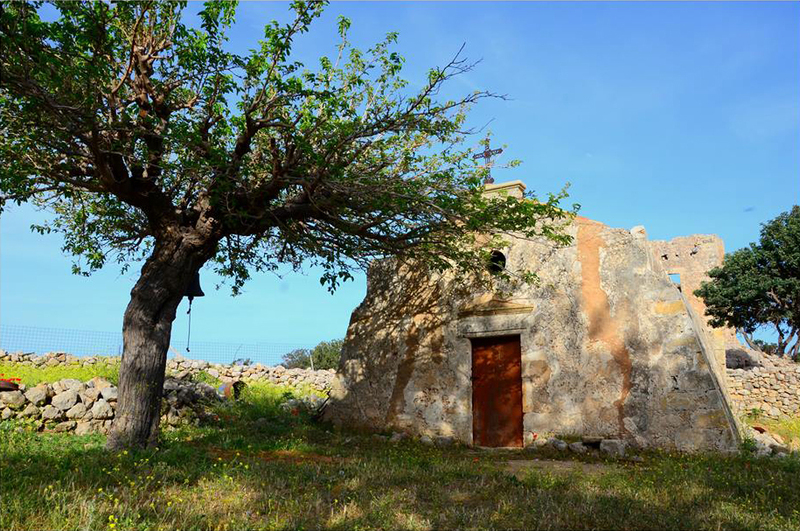 However, it is said that the temple might be even older, since Minoan times. The control of the area was under Kydonia and then to Polyrinia and the other way around. Both cities were in constant conflict for the temple. The area got excavated by the Germans during the Second World War and none knows what was found in this area. Some of the findings that came into light recently are a statue of the goddess Artemis, a head of a Hadrian and a whole body of another statue. All of them are presented in the Archaeological Museum of Chania. The road leading to the temple is of great interest as it is full of big stones that go from there to, probably, Polyrinia. 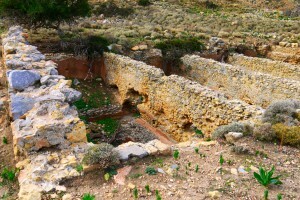 Nowadays you can notice some ruins of the street outside the village of Rodopou to the temple in Menies. The route is of 11 roman miles or 16,291 meters. Close the beach of Menies, just before you arrive, if you take a right turn 2km before the beach you can easily find the St. George Monastery. It was built many centuries ago, on about the 9th century A.C. but the monks abandoned it some centuries later. The reason for leaving it behind was the constant attacks from pirates. After repeated attacks from pirates the monks decided to move closer to the inland where they built a new monastery, again of St. George, in Gonia next to Kolimpari. Next to the monastery you can easily observe the ruins of a tower. It was built during the 16th century in order to surveil the sea for pirates. In the top north part of the Cape Spatha you can find the ruins of an old German fortress. 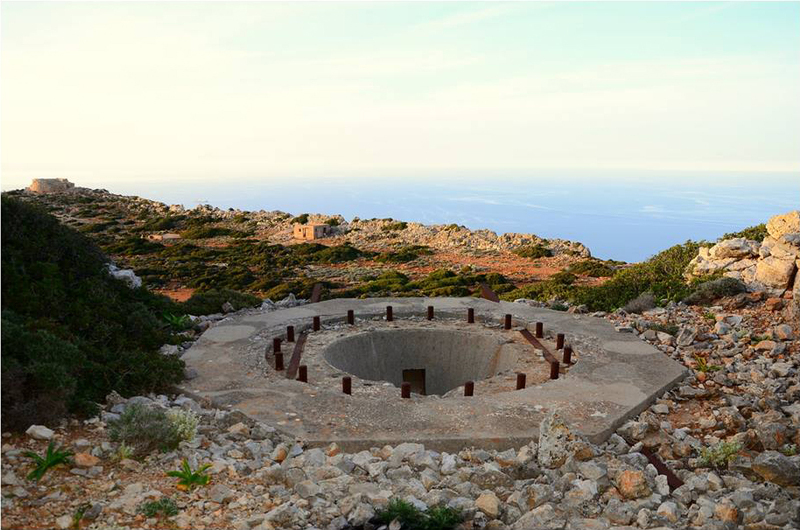 The base of a huge gun is still there overlooking the Sea of Crete. It had two barrels and extremely long range. 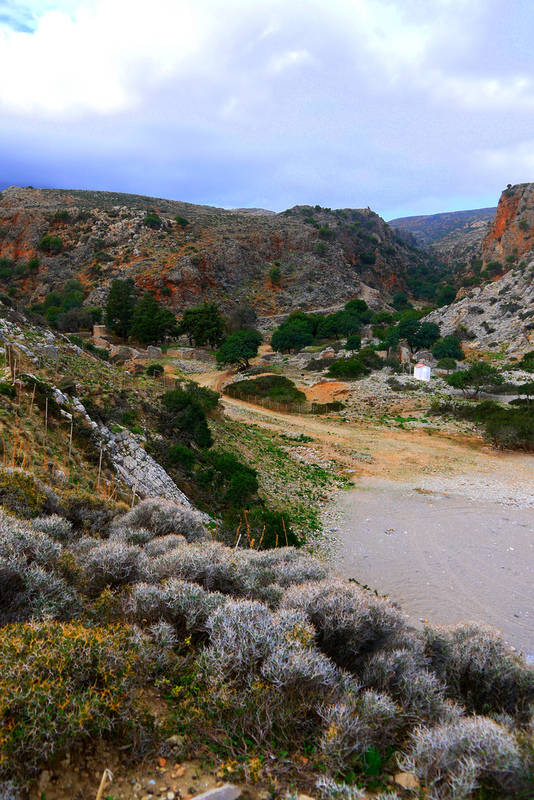 The same style of guns and location was used for the movie “The Guns of Navarone”. Is it a myth? Was it reality? Was it there or somewhere else in the Aegean sea? None knows. However we can freely dream while standing there. The best time to reach that place is near the sun set. If the atmosphere is clear you will be able to see even Kythira Island. 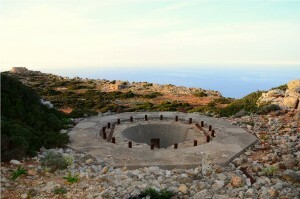 Watch the spectacular view to Kissamos Gulf and to Gramvousa Cape and islet. Once the light is still on you can take the route back home as you need about 1,5 hrs to reach Kissamos.